The Sharper Image Ionic Breeze Quadra has been proven to remove pollen, dust, animal dander and it can actually help remove bacteria, viruses & mold too. Today we'd like to offer you the revolutionary, new OzoneGuard that can instantly change smog & ozone into OXYGEN! With your help we can reach more people and let them know about Ionic Breeze Quadra by Sharper Image whether this product works or not. Two large dogs, three cats and two smokers, and this machine works wonders! When I left dear hubby to run the home for a few months, he didn't clean the filter (so the auto shut off kicked in) I walked in the door and almost fell over. First thing I did was clean the grid and turn it on. With in a few days we had fresh air! It doens't clean the house, but does remove a lot of odors and dust. I like it so much I now have one in every room. Only down side... they arn't cheap. My parents bought two of these useless products for their home. The only thing it does well is illuminate the room at night with it's blue LED, but cleaning the air it does not do. Listen folks, there is no way to circulate the air in the room 10 times/hour without fans, and you are lucky if this cleaner does half a circulation/hour. You can probably do better by opening the window. As far as the technology is concerned (HEPA v. ionic), ionic probably wins for most home users. 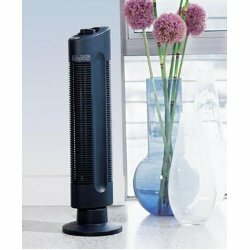 However, you need to get a fanned version of these, and here are many good products using Honeywell cells in various configuratins with fans.